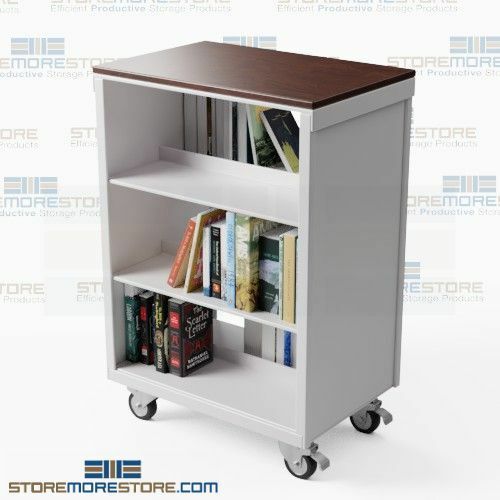 Easily transport loads and re-stock bookshelves with double-sided mobile book carts. Keep your books organized and secure during transport with double-sided storage that offers an ample 18 linear feet of space in a small footprint. 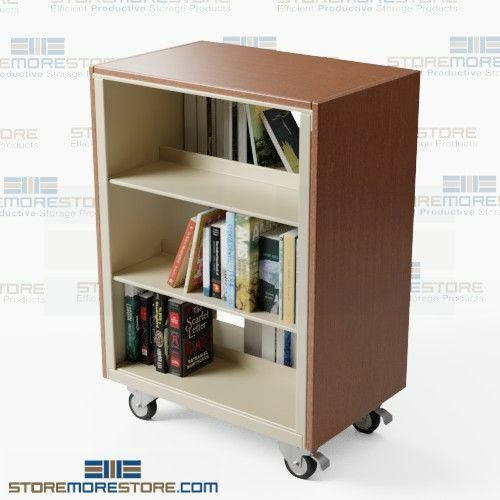 Its 1000 lbs capacity also allows users to store a large range of books and encyclopedias. To provide more flexibility, the three levels of shelving are easily adjustable in 1 ½” increments. Four large gray poly casters (two swiveling with locking brakes and two rigid) ensure smooth tracking on both hard surfaces and carpets. Its durable steel construction also contains 40% recycled content. Coated with an epoxy-polyester powder coat with no VOCs (volatile organic compounds), you can be sure that your stored books remain in top shape. Depending on your needs, the carts are available in three styles to choose from: with a steel top, with a laminate top, or with a laminate top and matching laminate sides. We also have a variety of colors and finishes for the carts to seamlessly integrate into your existing decor. Double-sided mobile book carts are available to buy online with free dock-to-dock shipping. If you need any assistance or just want some help picking the right solution for you, please call us at 1-855-786-7667.